C.S. Lewis and J.R.R. 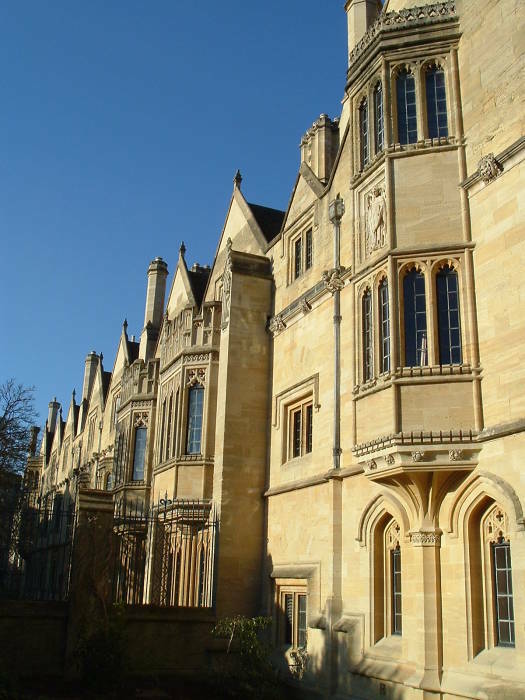 Tolkien taught at Oxford University, in the city of Oxford in south-central England. They both started teaching in 1925. 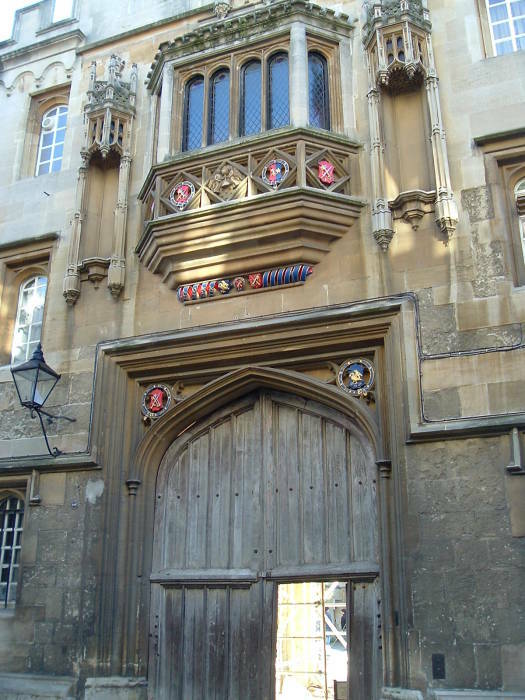 Lewis moved to Cambridge University in 1954, and Tolkien retired in 1959. They came to be very close friends during the roughly 30 years they were at Oxford together. Let's see what we can see today of their time at Oxford. The Tourist Information Centre in Oxford has lots of information. They sell a nice booklet for just £2 or so describing a very detailed walk around Oxford to see the C.S. Lewis and J.R.R. Tolkien sights. Lewis taught as a fellow of Magdalen College, Oxford, from 1925 to 1954, and then became the Professor of Medieval and Renaissance English at the University of Cambridge. Tolkien was the Rawlinson and Bosworth Professor of Anglo-Saxon at Pembroke College, Oxford, from 1925 to 1945. He was then the Merton Professor of English Language and Literature at Merton College, Oxford, from 1945 until his retirement in 1959. Lewis and Tolkien were members of an informal literary discussion group known as the Inklings. They were literary enthusiasts who praised the value of narrative in fiction and encouraged the writing of fantasy. Warren Lewis, C.S. 's older brother, wrote, "Properly speaking, the Inklings was neither a club nor a literary society, though it partook of the nature of both. There were no rules, officers, agendas, or formal elections." They met in Lewis' rooms on the campus on Thursday evenings to read and discuss various material, including manuscripts they were working on. 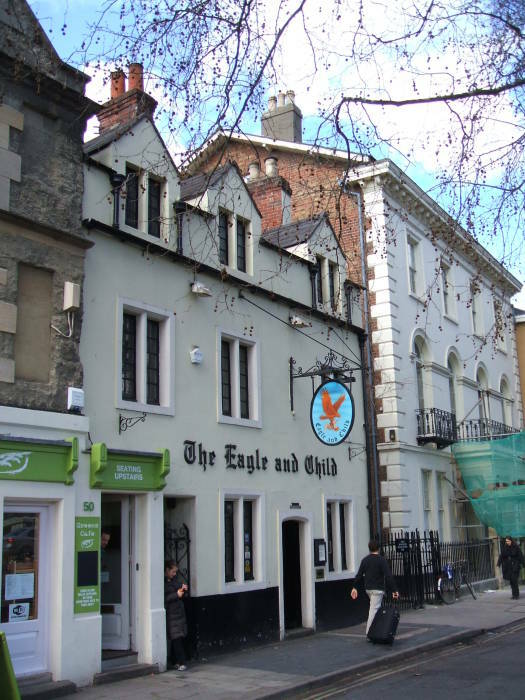 Less formally, they met regularly for lunch on Mondays or Tuesdays at the Eagle and Child pub, seen here. It's on St Giles Street, just across St Giles Street and to the north of St John's College. 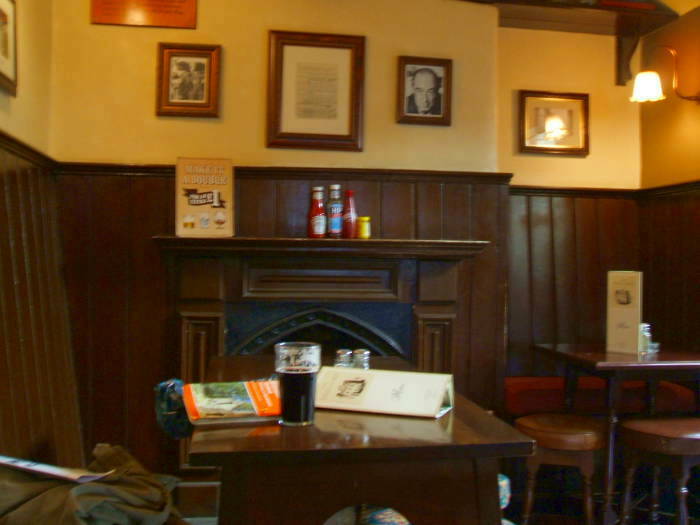 The pub was part of an endowment belonging to University College since the 1600s. 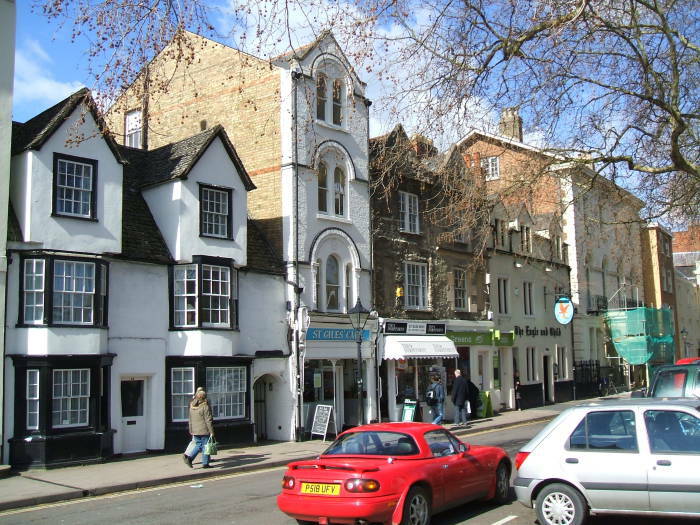 They sold it in December 2003 to St John's College, which also owns the Lamb and Flag pub across the street. The front section of the pub shows its age. 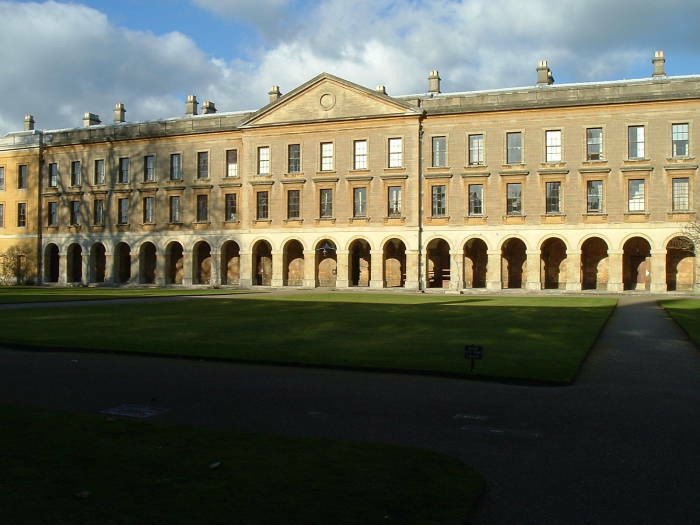 The earliest date usually given for its construction is 1650, although there are claims that it served as the lodgings of the Chancellor of the Exchequer when Oxford was the Royalist capital during the English Civil War (1642-1649). These windows look out on St Giles Street. 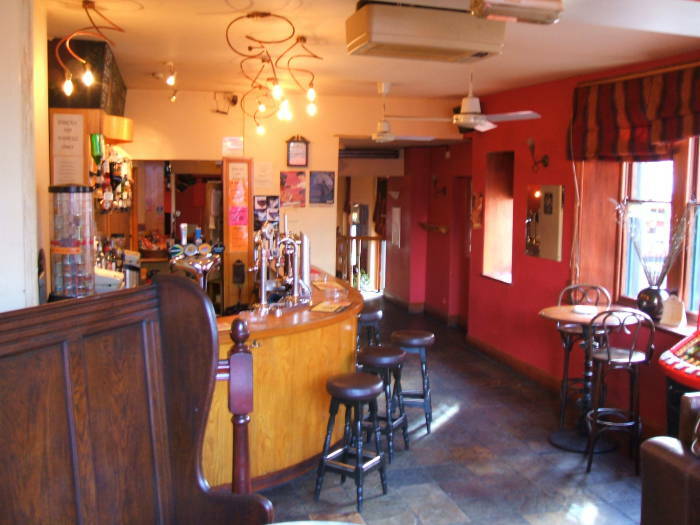 The Rabbit Room was the back corner room of the pub until it was expanded. 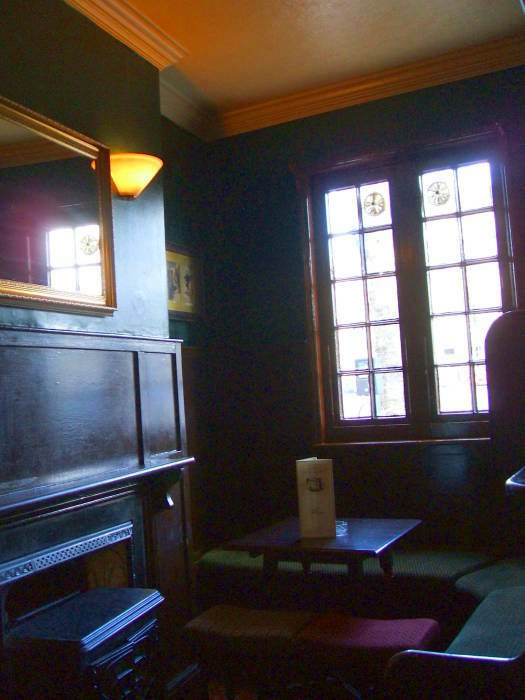 This is where the Inklings met, near the fireplace just across from the bar. The pub was modernized in 1962, with the pub area extended toward the rear and the Rabbit Room being opened up and made less private. That led to the Inklings moving their gatherings across St Giles Street to the Lamb and Flag pub. Colin Dexter, who created Inspector Morse, has also been a more recent literary regular here. The Eurobar sits on George Street in front of the coach station. For Americans, that's English for "bus station". Back when Tolkien was at Oxford, it had a different name and didn't have the flashing gambling "fruits machine" now standard in British pubs. This was Tolkien's inspiration for The Prancing Pony. That's the inn where Frodo get raging drunk and starts singing, this leads to an attack by the Black Riders, and then Aragorn has to save them. Who didn't foresee his eventual role as that king way in advance, pretty much from his first appearance? "Even from the outside the inn looked a pleasant house to familiar eyes. It had a front on the Road, and two wings running back on land partly cut out of the lower slopes of the hill, so that at the rear the second-floor windows were level with the ground. There was a wide arch leading to a courtyard between the two wings, and on the left under the arch there was a large doorway reaches by a few broad steps. ... Above the arch there was a lamp, and beneath it swung a large signboard: a fat white pony reared up on its hind legs. Over the door was painted in white letters: THE PRANCING PONY by BARLIMAN BUTTERBUR." — The Fellowship of the Ring, "At the Sign of the Prancing Pony"
This is not an especially nice pub, it seems a little rough and it's right in the coach station parking lot. Although I guess that's kind of the "Prancing Pony" vibe, so that's probably the most appropriate. These are some views of Merton College, where Tolkien taught. 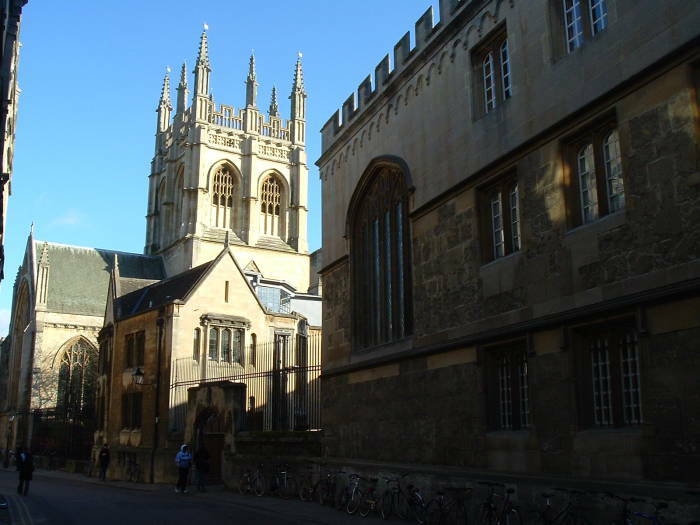 It was one of the original three colleges of Oxford founded in 1264. Its Old Library is the oldest medieval library still in use. It has a number of 15th century astronomical instruments, including an astrolabe that may have been used by Chaucer. It's south of High Street, near prominent Christ Church College. 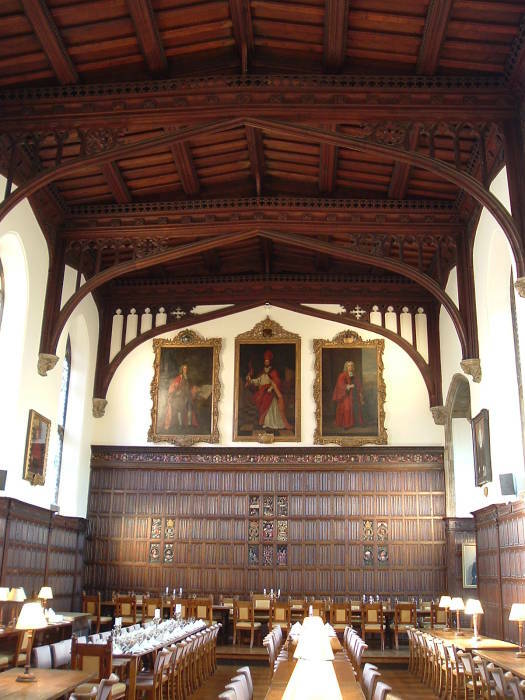 Below is Magdalen College, where C.S. Lewis taught. It's pronounced mawd-lin, as the English word "maudlin" came from the earlier pronunciation of what we now spell "Magdalene" and pronounce mag-dah-leen. 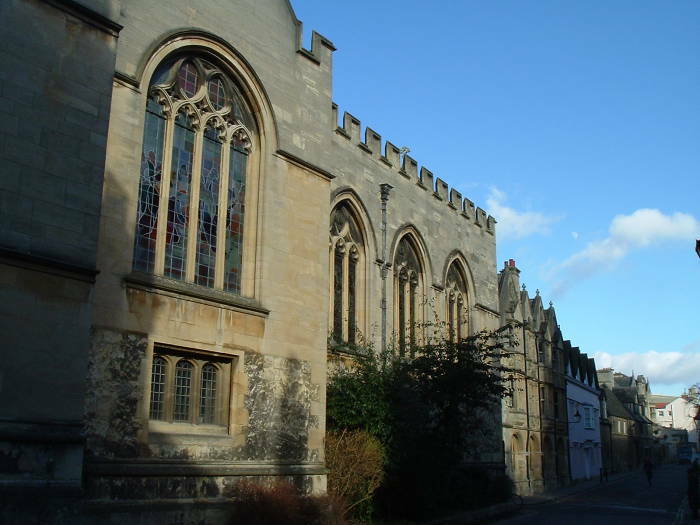 The college was founded in 1458 by William of Waynflete, the bishop of Winchester. 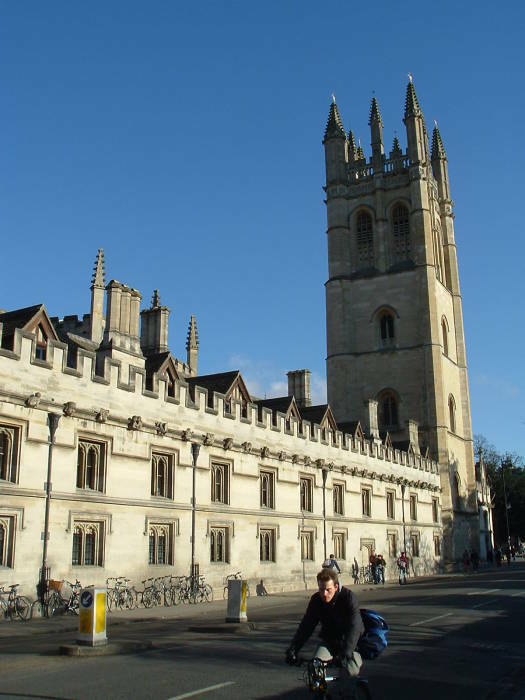 The large square Magdalen Tower is a famous landmark of Oxford. It was built starting in 1492, completed in 1509. The college choir sings from the top of the tower at 6 AM every May 1st, a tradition since the tower was built during the days of Henry VII (ruled 1485-1509). They sing two traditional hymns, Humnus Eucharisticus and Now is the Month of Maying to start the May Morning celebrations in Oxford. 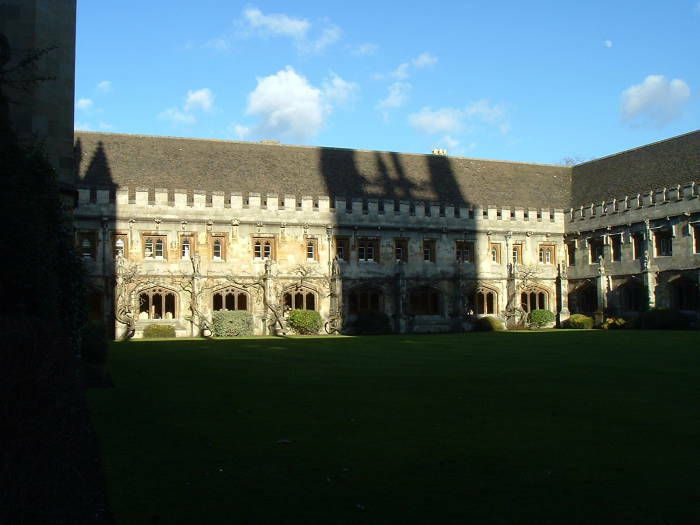 The statues around this cloister within Magdalene College gave C.S. Lewis the idea for the statue-like frozen animals in Narnia. 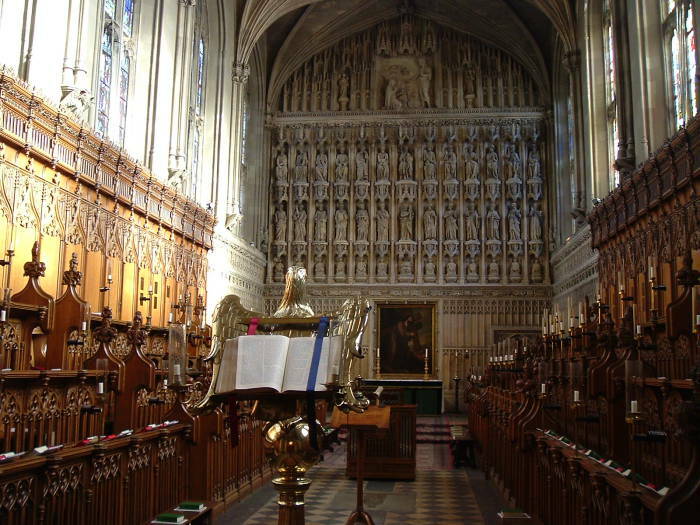 The chapel within Magdalen College dates from the late 15th century. 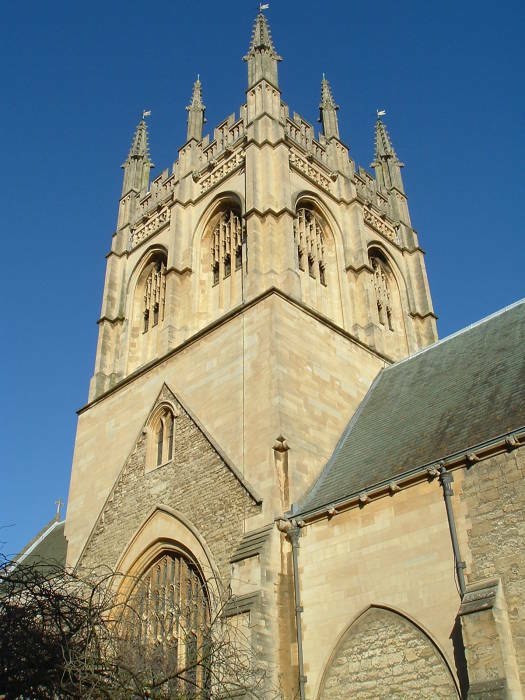 It is a place of worship for members of Magdalen College, other members of the Oxford University community, and people from the community of Oxford. Choral Evensong is sung every evening, with services every Sunday morning. This is the choir of the chapel. The choir, once spelled quire, is the area of a church or cathedral between the nave and the sanctuary. 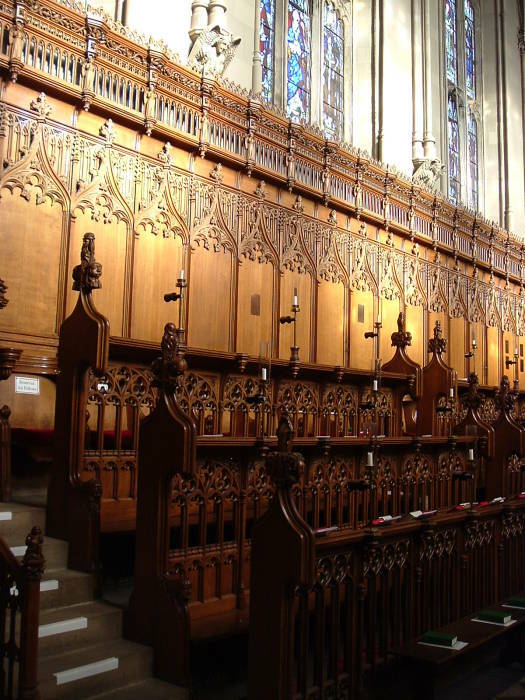 The carved wooden seats are known as choir stalls. 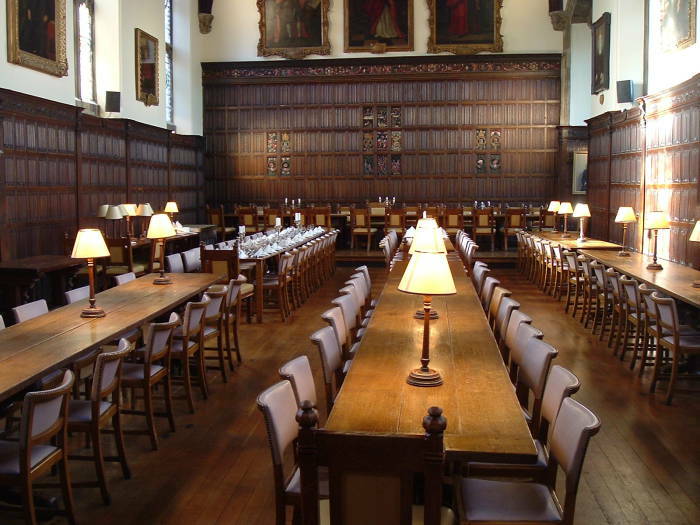 This is a study hall within Magdalene College. 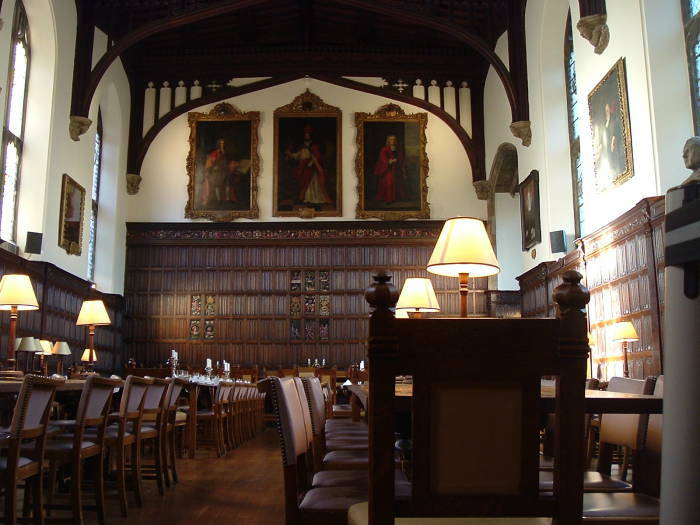 This is the grand dining hall within Magdalene College. C.S. Lewis lived in this relatively modern residential hall. It is the New Building, constructed in 1733. The original plan was for this to be one side of a new large quadrangle, but this was the only side completed. Many of the rooms here are occupied by tutors. 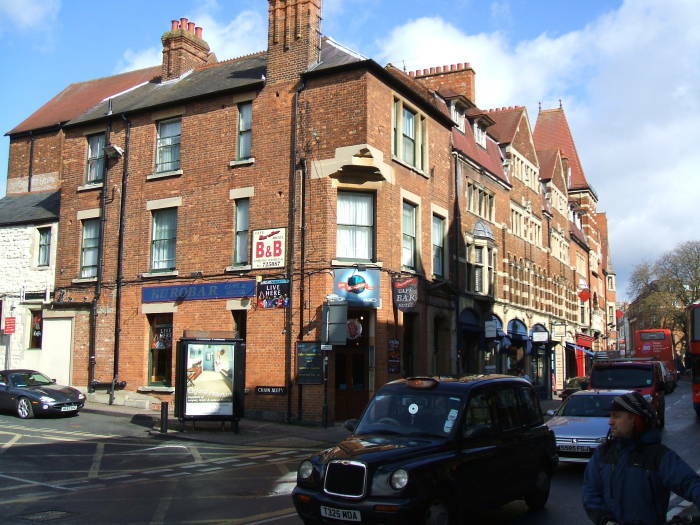 The student rooms are highly sought after as there are relatively few available. I've stayed at Oxford Backpackers, 9a Hythe Bridge Street, Oxford OX1 2EW, +44-(0)1865-721-761, www.hostels.co.uk, it's a nice place in a great location. "Human Form in Religious Artifacts"
and so on. It's not alphabetical, and it isn't thematic as far as I could see. Also check out the great Blackwells book store.